The week to week thoughts and deliberations of a writer that authors, a thinker that dreams, and a realist who hopes. I don't think collaboration is a skill that automatically comes with the writer tool set. A lot of the quotes about writing and being a writer mostly involve ideas like stillness and solitude. But no matter how good the words in the book ultimately are, the initial cover presentation accounts for a lot. I guess it's very similar to attracting a desired mate. In most cases, they see us first. Before they know anything about us, they interpret how we choose to express ourselves outwardly. I can't speak for other writers, but I don't draw all that well. Certainly not well enough to produce a cover. Nor do I have any talent at all at photography or graphic design or painting. I tell people, in fact, that it's because I can't express my ideas in a representative fashion that forces my words to come out the way that they do. So, all of that is to say I had to tell someone else about what I wanted my cover to look like. This was the initial sketch the artist produced just to verify we were on the same page. What I described was a modern city bus, because it is somewhat of a theme in the novel and because I could think of nothing more everyday than a mass transit ride. I also liked the metaphor of the bus: all the characters are in it, but they aren't necessarily together. Going along with the idea that an urban fantasy cover needs to be firmly seated in the modern world, while espousing some element of the mystical or magical, I expressed that I wanted the banality of the bus, with some hints at the supernatural. 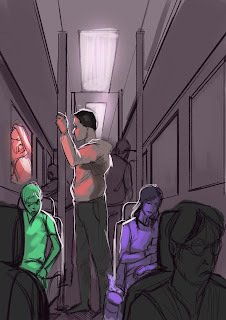 In the sketch you can see that one of the characters has a reflection in the window that doesn't match what the character looks like, and another has a travel bag with some interesting light effects coming up out of it. All in all, I think we ended up on the same page, but it was still really interesting to me how far apart my mental image was of what I was saying and what the artist's ended up being. We discussed the narrowness of the image. What I didn't realize was that buses are not the same everywhere (the artist is Nigerian) and that books are nominally taller than they are wide, so my mental image of a wide image made no sense for the product I wanted to use it for. I imagined every bus I'd ever been on, from school to city, and the squareness of the windows, the arrangement of the hand rails, the lights in the ceiling, said train to me. We did not have the same conception of what gives a bus, "bus-ness." I was stunned for a bit at the inadequacy of language. And I was gratified at the sensibility of getting an initial image into play to make sure all parties were even facing the same direction. I didn't know how many different things could be simultaneously miss-communicated. And that says nothing of the other elements I hadn't accounted for. The artist decided to highlight in color the principle characters whereas I had imagined they would be the only people visible. But with the change, there was opportunity for the other figures left dark and grainy. I try to use every detail to my advantage when doing things like this, so I instantly had ideas of how to keep the other figures in shadow but to use that to further enhance the mystery of the image and understanding of the book in the midst of reading it. And I never would've thought of any of that had the artist not made certain decisions, not for my sake, but to bring to light the things they heard me describe as important. There are plenty of ways to get a chicken across a road. It could be carried in a basket or in one's stomach. Both have very different outcomes while both satisfy the ultimate requirement. So, the revisions are coming along. I am mostly happy with them, even though I have some decisions ahead of me to make, ones that I didn't image would be giving me this much trouble. But it's been so many years, I truly am looking at the stories like an outsider. There are ideas in the writing that I feel strongly are there because I had strong feelings, but I can't remember what I was really trying to say. The words are the words of a younger, more impetuous me. I feel almost like a parent, cleaning up behind someone who doesn't know better. I love what they accomplished, but I also shake my head sadly. And the cover is coming along, as well. It took weeks to find someone, and I guess success will be decided on receipt of a finished product, but I feel confident so far. The communication is open and semi-constant. The most recent lesson I am learning from all of this is trust. Simply believing in someone else to do their part. One part letting go and one holding faith. Collaboration. I saw my first author information sheet more than a few years ago. It asked questions about the main characters, what they looked like, the setting of the story, and what I wanted my cover to look like. To say I didn't know about any of that would be an understatement. I knew who the characters were, what they looked like, but I knew so little then about covers that it may as well have been nothing. When I finally got into rounds of revision with the cover artist I began to understand the difficulty of two people trying to share the same vision. I understood what my theatre friends told me about artistic collaboration, and why it was it important, and how it could be so difficult. And that was way, way before anyone broke down for me why some covers sell, why some don't, and what a reader is actually shopping for when they're scrolling through images that represent books they might buy and read. Today, after days of scouring portfolios and reading reviews and re-reading the book and thinking about telling images, I reached out to an artist in hopes that we might have some productive dialog. Very little about the cover, but more about style. What I was trying to achieve and how I wanted to go about revealing that to potential readers. Before even getting into what a cover needs to include to convey an idea, I realized that even if I only wanted my cover to be an image of an apple, there would be a million ways different ways of even thinking about presenting the fruit. Background, no background, color, ripeness, wetness, lighting. Is it a photograph, is it water color, is it digital. Light tone, dark tone. Is it on its side, decaying on a rotten park bench under failing street light, or is it standing proud in the sun on a carefully placed picnic plate? How do I want the viewer to feel about the apple? And that's kind of emblematic, I guess, of where I am now and where I was. I'm thankful for the growth, and for an opportunity to more precisely display it. The revisions have been sweeping and pervasive. There are some things that I wish I could change that I can't, because they have become intrinsic to every other part of every other story in the setting, but there are things I am very gratified to be able to improve on. Something I didn't realize I'd learned until I noticed I don't do it anymore is a phenomenon where how I feel about an idea or topic bleeds through into the rhetoric, despite whether that storytelling is valuable to the story. I think I maybe finally understand why one should not publish their juvenalia. When learning something like how one writes, one is also very likely working out the kinks of their world view, also. How they feel about hot button issues, and what they believe to be right. Those can be motivating and focusing, but a writer needs to be able to do whatever the story needs to be better, including getting out of its way. Many, many times, I find that once the story gets full enough, one of the first things that needs to go is the author themselves. And there were times during this process that I could see myself in the scene. It was nice to fix those moments. So, yeah. Plans. I think all of this has been a continual learning process, but here lately it feels like I've come to realize so much that my progress before was almost the same as standing still. But I guess that's the difference between looking at a photo taken last year and a photo taken a decade previous. I look at how much smaller I used to be. And I smile. On Friday I had another opportunity to talk to creative writing class at a local high school. The teacher expressed the writers taking the course having some issues with their worlds being believable, and being unable to tell what changes are needed to create immersive settings. So, I went in and talked to them about suspension of disbelief and immersion and internal logic. I had them do a writing exercise about a character's day in the life in a world just like ours except for one specific change (one group opted for everyone being born with a third arm, and the second group voted for dinosaurs never dying out), after which we discussed things they learned when it came time to start putting words on paper. It was my contention then, and continues to be, that actually putting lessons into use is where the learning lives. I was happy that they had questions after the fact, that they realized some things about the difficulty of what they were attempting (turns out a slightly different but non standard physiological difference changes art, fashion, sports, and labor). In the end, it set up an ability for me to tell them that it's the little things that are important, the tiny details that are so often overlooked that add up to make the difference. I hope it clicked for some of them. A number of them thanked me with the sparkle of possibility in their eyes. The previous Friday I had a conversation with another author who was very experienced on the marketing side of things, and was very interested in sharing that information with me. It was pretty gratifying, in a lot of ways, that someone else would seek me out with the kind of perspective I'm kind of blind to. it wasn't completely altruistic, but if someone thinks you can help them, then they're also paying you the compliment that you are helpful. I've historically focused on making my settings believable and rich, the characters round and interesting. But it's probably close to the truth that just about every author would benefit from knowing all the little tips and tricks that are proven to result in higher presence, more sales, etc. It was also pretty interesting to discuss artistic philosophy. I don't get a lot of that. A lot of what he had to say made sense, and I've been absorbing it over the last couple weeks, trying to use every corner of it to my advantage. So, taking a step back, I've added a couple items to the year's list. There's the novel, of course, which I'm ashamed to admit has not been increased. I haven't opened any of those files at all. I have been conceiving of more issues of the comic I started a script for. I finally got some feedback for the first installment, and there might be something there. But it's also a bit of an energy sucker, and I'm very regimented so it bugs me a nontrivial amount that I'm kind of all over the place. A different writer friend told me that thinking about the writing counts as writing. I thought about that for a bit, and I'm not sure I agree. At least, thinking about a story for a year doesn't finish a project. It might be exactly what is required, but by itself, it's still less effective than writing something down. But I've been wrong before. The last items recently added are re-edits for four books I've already written. I have no clue about the order of events to get all that done. The year is already a quarter over. It's also nowhere near done. A writer living. And reading, and writing. In my spare time, I like to catch up on work pushed to the side for all the dreaming.